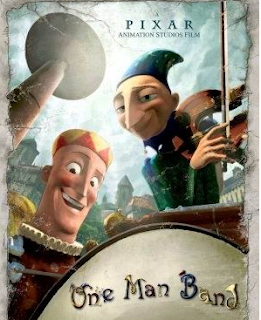 This week I am featuring the Pixar short film "One Man Band." This film was shown alongside the movie "Cars" in 2005. "One Man Band" is completely wordless, which makes it a great tool for teaching students with difficulty comprehending the complexities of oral language. The rich visual and auditory information provides more than enough context to gather meaning from the story. See Wikipedia for a run-down of the plot. I have so many ideas to share for using this excellent Pixar short in therapy! But I'm going to start a bit backwards with this one... The kids have already seen the movie a few times in my inferencing, character trait, and dialogue lessons, so I'll be sharing my lesson on summarizing that I plan to use in therapy this week. This lesson focuses on the ability to summarize a story. I've also woven in a past tense verb exercise towards the end for our friends who struggle with grammar. It is important to realize that there is a lot of dense vocabulary going on in these higher-level language groups. When I noticed that most of my students (many of whom also have attentional difficulties) still did not have a working knowledge of key vocabulary (e.g., infer, summarize, plot), despite having had plenty of exposure to them, I wanted to devise a way of making the vocabulary more salient and functional. So I started using a “clap” to alert the students to tricky vocabulary. I’ve written out the dialogue for this part of the lesson so you can see how it works. You’ll notice that the terms are in CAPITAL LETTERS in context, which just means that I add emphasis while saying them. This serves as a clue for the kids that I'm saying an important term, wakes up anyone off in la la land, and also means that I am about to give a CLAP and will expect their response! When [CLAP] is written in the script, that means that I clap one time, and the students echo that clap, hopefully in unison. The claps can be a little disjointed at first, but once the students get the hang of it, the response becomes more immediate. The clap provides a predictable and concrete auditory clue - It really works to draw in even the most inattentive friends. In addition to the clap/verbal discussion, I always write the word on the board and jot down notes as the students offer their definitions. Hopefully this visual gives their brains some additional info to latch onto. If we have extra time at the end of the session, I will refer back to the board and ask each student to restate the definition one of the words/provide an example. · We’ve watched this movie a couple times now so we are pretty FAMILIAR with it. o [CLAP] What does that mean, “familiar?” *write on board. o [CLAP] What does that word, “summarize” mean? *Write on board. · Right, so we will summarize the story. We will tell what happened. · We won’t tell every single detail, but here is what we will tell. 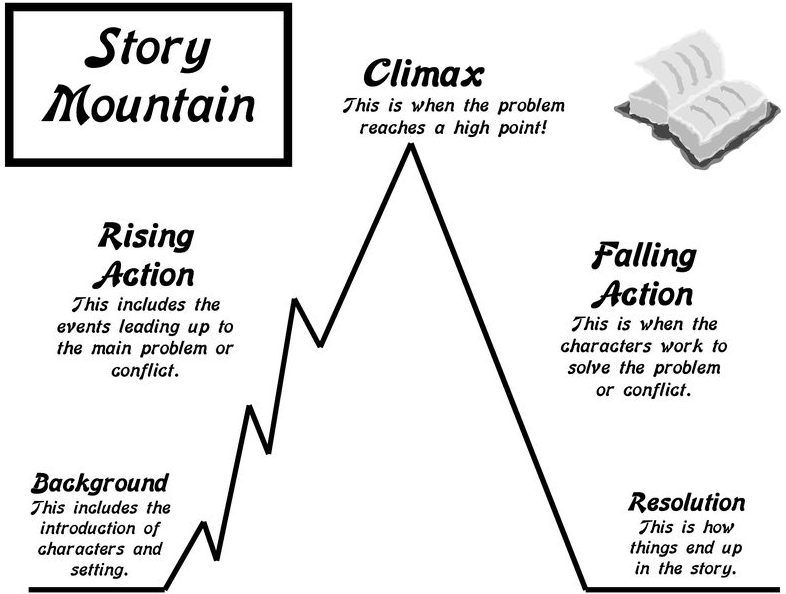 (Display story mountain graphic from Scholastic, pictured below) We will tell some (1) background information (point out the description under the word background and instruct one student to read it: “student, tell us what the “background” should include”), the (2) rising action (choose a student to read description on worksheet), the (3) climax (choose a student to read description on worksheet), the (4) falling action (choose a student to read description on worksheet) and the (5) conclusion (choose a student to read description on worksheet). · Each of you is going to get a picture from a part of the movie. 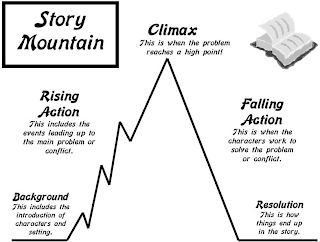 You need to work together to put your picture in the correct spot on our story mountain. I haven't included pictures in this posting due to copyright issues, but you can easily pause the video and take screen shots of key events. · I want you to work together, but you may only use your words for helping one another, not your hands. 3. After review of vocabulary and expectations, students are called on “round robin” to offer one event in the summary. · Wow, it looks like all the events are in order! Now let’s put it all together in our summary. We will take turns telling what happened next in the story. We will use sentences with TRANSITION words to describe each event. o [CLAP] What are "transition words?” *write on board. Give me some examples of transition words. *write on board (e.g., first, then, finally). · Do you think we will use present tense or past tense to tell about what happenED? · You got it, we will use PAST TENSE. o [CLAP] What does that mean, “past tense?” Right! Past tense verbs, or action words, are used to tell about what has already happened. 4. Review list of past tense verbs. · Wow! You did a great job summarizing the story, and you also did an excellent job listening for past tense verbs. · Let’s practice some of those verbs – I’ll say the verb in the present tense, you say it in the past. Select a verb from the list and create a sentence in the present tense. If students are really getting it, have one of them create the present tense sentence and the others change it to the past. Hope this lesson was helpful for you. Stay tuned for more to come on using One Man Band in therapy! I'm a Philadelphia based SLP with a passion for providing individualized therapy. My areas of interest include childhood apraxia of speech, fluency, and language impairments. In addition to treating private clients and pursuing my PhD in Communication Sciences and Disorders, I create innovative materials and helpful resources for practicing SLPs.